Is this an epidemic? After we published a story Tuesday about men on dating sites who really really don't like it when you give them radio silence (however brief or long that silence is), we got inundated with similar stories from other women. This woman went on an, again, unimpressive first date that she admits she could have handled better: she gave the dude hope, writing "We have to do this again sometime!" at the end of it. 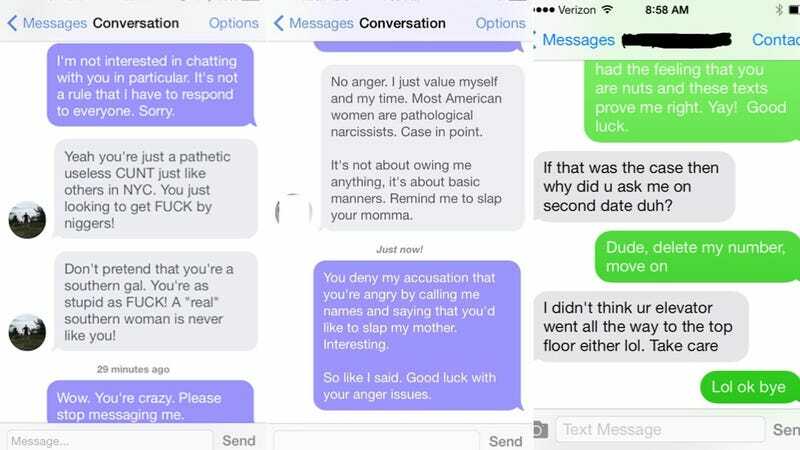 After that, he kept texting her for a few days, which she was sort of receptive to. But finally, she realized she wasn't into it and decided to cut it off – "Because that's what all the websites say you are supposed to do instead of the 'fade'" – sending him a text that said basically, "Hey, had a fun time the other day, but I'm not really feeling the spark between me and you, all the best and good luck on Match!" This was apparently not okay. For a little legitimate analysis of these types of responses, I turned to my friend Josh, who tends to have no tolerance for these types of dudes but also seems to at least to have a perspective on where it's coming from. While I and many women chalk this behavior up to men who feel entitled to a response from women, Josh said he also credits it partially to the fact that "men aren't taught that pillar of adulthood, disappointment management." "I can understand feeling rebuffed," Josh said. "It's like impossible for most dudes to get any response in these environments. But these guys have no idea what to do with those feelings, it's scary. And it's always about their feelings. Always about their feelings. Always about their feelings."